ProEar is a carefully selected blend of plant extracts that provides fast relief for irritated, itching ears while providing the nutrients your ear needs to restore and maintain healthy tissue. It contains vitamins (A, E, D3) and other nutrients that nourish the ear. 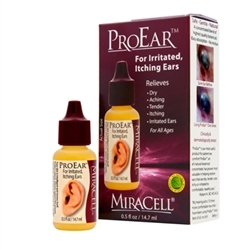 It quickly absorbs into the ear tissue, so you never have any greasy, oily residue to clean off. Everything in it is a food grade ingredient because you're 'feeding' your skin with good ingredients. Your skin is complex and intelligent. Your skin knows how to repair itself, it just needs the right ingredients. As people age, the ability of the body to provide good ingredients to your ears may diminish. This is due to poor circulation, diet, diseases, drug side effects and other factors. ProEar provides the nutrients at the site, greatly increasing the availability of these important ingredients.